From helping China's leading radicals check out books as a librarian at Peking University, Mao rose to take command of China's Communist Party, leading them in a civil war against Chiang Kai-shek's American-funded Nationalist government. Mao Zedong is born in Hunan Province in 1893. Mao often argued with his strict, domineering father, who pushed him to pursue a Confucian education. Mao pursued his classical studies but his true loves were China’s classic adventure novels: The Water Margin and Journey to the West. As the imperial examination system crumbled, Mao also discovered the writing of turn-of-the-century reformers, eagerly gobbling up the work of Kang Youwei, Liang Qichao and Chen Duxiu. As a teenager, Mao studied history, philosophy and geography at a school in the provincial capital of Changsha. One of his very first literary efforts was an essay in 1912 on Shang Yang, the great Legalist ruler. Mao was an avid reader of Chen Duxiu’s journal, New Youth. In 1917, Mao made his first contribution to the magazine, an essay on physical education. Upon graduating from school in Changsha in 1918, Mao moved to the capital and became a librarian at Beijing University, where he worked for Li Dazhao. There Mao finally met many of his intellectual idols, but as a bystander, checking out books for them from the library. Mao perhaps developed some resentment towards the intellectuals who dismissed the young student with a rural accent. Leaving his library post, Mao was inspired by the May Fourth Movement to become a political organizer back in his native province of Hunan. Back in Hunan, Mao was one of the first of the first reformers to focus on the political energy locked up in China’s peasants. In 1919, he penned an essay, “The Present State of China’s Great Union of the Popular Masses,” expressing early stirrings of Mao’s irrepressible iconoclasm. "Question the unquestionable! Dare to do the unthinkable! Do not shrink from saying the unutterable. No force can stop a tide such as this; no one can fail to be subjugated by it." Mao was setting up local communist cells in Hunan when he received the invitation to travel to Shanghai for the First Congress of the Chinese Communist Party. Party founders Chen Duxiu and Li Dazhao were unable to make it to that first meeting, and Mao’s attendance lent him higher standing in the party afterwards. While Chen Duxiu and Li Dazhao set off to organize China’s cities along standard communist terms, Mao returned to his focus on Hunan peasants. He continued to articulate his belief that peasants represented the most viable source of revolutionary support and submitted this idea to the Party in his “Report on an Investigation of the Peasant Movement in Hunan,” in 1927. This report contains one of Mao’s most famous lines, “a revolution is not a dinner party,” or geming bushi qing ke chi fan, (革命不是请客吃饭). "A revolution is not like inviting people to dinner, or writing an essay or painting a picture, or doing embroidery; it cannot be so refined, so leisurely and gentle...a revolution is an uprising, an act of violence whereby one class overthrows the power of another...to right a wrong it is necessary to exceed the proper limits; the wrongs cannot be righted without doing so." Many years later, in a 1940 essay, Mao stated this contradiction most clearly in the famous line, “There is no construction without destruction,” bupo buli (不破不立). 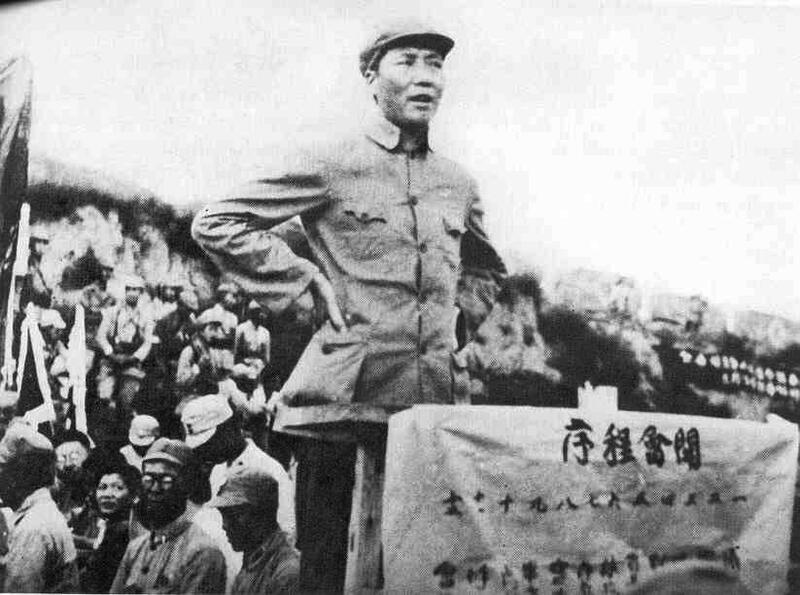 Penned in China’s south by Chiang Kai-shek‘s Nationalist forces, the young Chinese Communist Party organized a “liberated” communist state in parts of Jiangxi Province. As attacks by the Nationalists increased, the Red Army was forced to retreat 6,000 miles across western China in its famous “Long March.” Only 10% of the communist soldiers survived. During the march, Mao and Zhou Enlai took advantage of the chaos to ensconce themselves as paramount leaders of the Chinese Communist Party and the Red Army. Much of what we know of Mao’s childhood is quoted from an interview with American journalist Edgar Snow, who traveled to speak with Mao at the Communist’s base in Yan’an. Snow spoke to Mao about his relationship to his father, his influences, hopes and dreams, and included a biography of Mao in his book Red Star Over China. 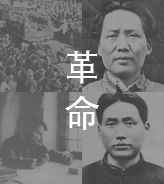 During Japanese War and World War II the Communist Part spent nearly a decade in Yan’an, developing many important aspects of Maoism. From this base of power, Mao would launch the last phase of a revolution that swept Chiang from power and established the People’s Republic. Mao used the war years to develop ideology that would govern the party’s direction for decades. He put forward the system of self-criticism and made famous speeches on the political role of the arts and the media. Mao was joined by an American delegation during World War II (to liaise between the Communists and Nationalists) and initial perceptions of Mao by the Americans were quite positive, at least by comparison to Chiang. Mao’s government was not as corrupt as the Nationalists, and didn’t suffer from Chiang Kai-shek’s timidity during the war.